The Sheep River Provincial Park, east of Turner Valley is a stunningly beautiful region of foothills that features rolling hills, mountains, deep gorges and stunning vistas. During summer the Province leases land for grazing to a group of ranchers. These are pictures from the fall round-up including photos of the park and our ride back to Calgary. There were perhaps 30 or more ranchers bringing in the cattle, carrying on Alberta's rich ranching history. Due to the steep hills, rugged land and forest, quads do not work to round up the herd as has become popular in much of the ranching community. The round-up involves horses and riders as it did for decades in the past. Although I didn't get to take photographs of the round up, the cattle were brought back to a central location where over a few days were separated by ownership into several pens, then taken to their respective ranches for the winter. Roundup Gallery #1 Introduction & Sheep River Provincial Park: Some photos of the park and our trip out there including a one antlered moose, elbow falls and some scenic pictures. Roundup Gallery #2 Thompson Roundup – Getting Ready (pre cutting): These are pictures of the buildings where the roundup takes place and some of the crowd who were there during the round-up. In this and the last gallery, I did some experimenting with effects on a few pictures (artistry run wild). Roundup Gallery#3 Sorting out the Stock: These pictures are of the cutting and many of the riders/ranchers helping out. Sorry about the number but there was lots of riders to help out. Recent Photographs Galleries: Did you miss a gallery? This takes you to a listing of gallerys over the past year or so. 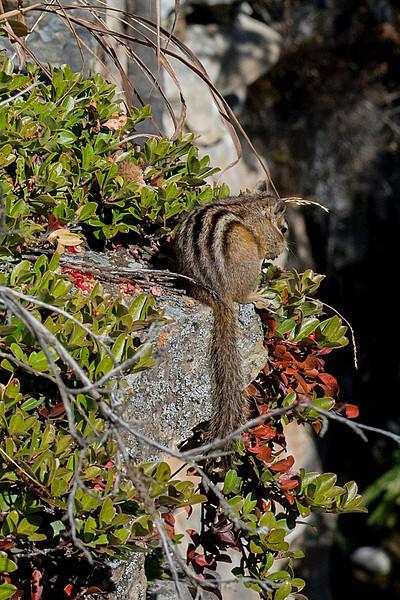 This Yellow-pine chipmunk came within a few feet of me as I was taking a photo of this colourful ledge. We were both pearched precariously on a 30 foot cliff while he ate Kinnikinnick berries. Nice (and dangerous) work. Very lovely mix of colors.